EasyHits4U is one the most prominent online marketing programs on the Web. Over 1,543,000 members joined our program during the last twelve years. But how does it work? What can you achieve on EasyHits4U? EasyHits4U 101 answers these questions and many others. The goal of this quick guide is to get you up to speed on how to get the maximum benefit from your EasyHits4U membership. You can also check our FAQ and Tutorials sections. EasyHits4U is the most popular traffic exchange program on the Web with over 1,543,000 registered members. Our program allows you to promote your own sites, referral/affiliate links from other programs, banner and text ads to other registered members, and build your own downline here. We have delivered large volumes of traffic to our members' sites since 2003. You can request payout to your account as soon as you earn the minimum of $3.00. You can also convert earned cash into credits, impressions, or Premium Days at any time. Surfing is the process of viewing sites submitted into rotation by other registered members. One credit is the same as one visitor to your site. Each credit you earn can be exchanged for one visitor to your page. Banner/text ad impressions is the number of times a banner/text ad is rendered for viewing. One impression is equivalent to one opportunity to see an ad. Banners and text ads are shown to all members when they surf member sites and also inside the members' area. The Exchange ratio can be 2:1 or 1:1 at EasyHits4U. 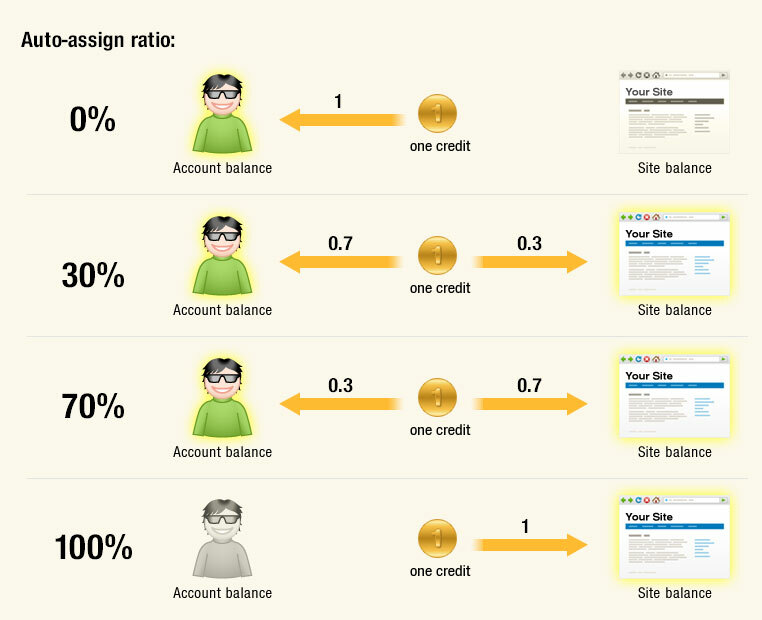 – a credit of 0.5 goes towards your Web site balance (as "assigned" credits; 1 credit is equal to 1 visitor). So, in fact you are getting 1 credit for every site you visit with 1:1 exchange ratio. While you are surfing you are given surf drawing tickets for the current day's drawing. Ten lucky surfers receive a $1 cash bonus each, ten surfers receive 500 credits each, ten surfers receive 5000 banner impressions each, and ten more surfers receive 5000 text ad impressions each. When the drawing is made at the time of the server restart, winners automatically receive email notifications about their prizes. After that, all old surf drawing tickets are voided and a new drawing starts. More surfing = More drawing tickets = More chances to win! What are referrals and why do I need them? You receive a $0.10 cash bonus for every person you refer that surfs 100 or more sites. You can promote your programs to referrals from the "New message" page at any time. Promote our splash pages, banners, and text links on other websites. We have created a lot of different splash pages, peel away ads, banners, and text links to help you refer new members. Create unique-looking splash pages with your EasyHits4U referral link using our free Easy Splash Builder tool. Splash pages usually work very well in traffic exchanges. Can I earn some cash with EasyHits4U? We pay you $0.10 for every person you refer who surfs 100 or more sites. You will earn commissions of up to 40% from all purchases of Easy Splash Builder and Easy Rotator tools made by your first level referrals. Please note that EasyHits4U is not a moneymaking machine. 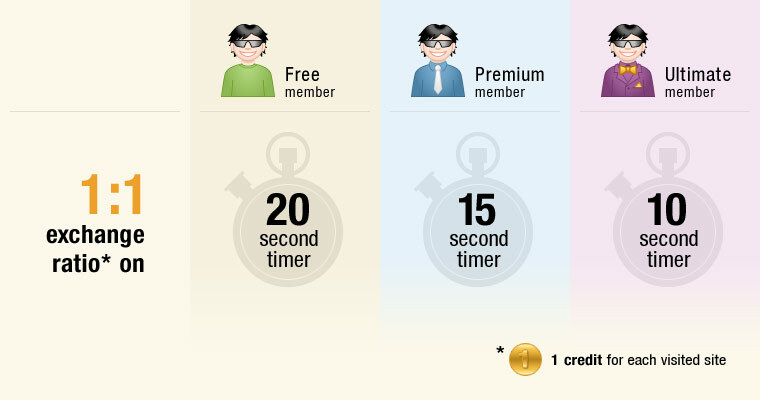 The site is designed as a traffic exchange, and the bonus that members receive for surfing is simply an added benefit. The site is not designed to encourage people to work full time to make money. It is absolutely free to participate in EasyHits4U, but if you are a serious marketer and use EasyHits4U regularly, you may want to try our Ultimate membership. Referrals are added to your account randomly from direct sign-ups. Use only fresh promotional materials to get better results. Check our newsletters for contests, updates, and new features. Use custom splash pages regularly because they work very well in traffic exchanges. Build relationships with your referrals, but don't spam them. Analyze the results of your ad campaigns with internal statistics and with third party tracking tools. What bonuses will I get? Paid members receive even higher guaranteed prizes. More you surf — More chances to get your guaranteed prizes! Earned credits can be converted into traffic to your sites. $0.10 for every person you refer that surfs 100 or more sites. Up to 30% of credits earned by your referrals. Upgrade your account to receive 10-15% extra credits from your referrals. Geographic, day and time targeting for your ads. Regular Surfing and Referral Contests with cool prizes. Friendly support from our team. New and new regular features and bonuses become available all the time! What is Easy Splash Builder? You can create, update, host, and track your own splash pages for any website with this free tool. Promote eye-catching short splash pages for any program, not only standard affiliate/referral pages, to get more signups and sales. Do not forget to submit your new splash page into rotation at EasyHits4U and to other programs you use. This free tool will help you to manage, host, and track your own site rotators for FREE. When users open your rotator link, one of web pages from your rotator will be shown to them automatically. Instead of managing all your links in all the programs you use, you can simply enter your Easy Rotator link in all the programs you use (only once) and update the list of your referral/affiliate links inside your Easy Rotator from one place any time. Obviously, this tool will save you a lot of valuable time. So let our Easy Rotator script to do that boring stuff for you! What about the Links Directory? Our Reciprocal Links Directory was designed to help you find sites within categories of interest. You can also increase your sites' link popularity and their volume of targeted traffic when you submit your sites in the directory. To be approved in our Links Directory, you need to put a link to our site from the site you submit. We listen to our members. We can't live without regular polls and surveys. Your opinion is very important to us. We develop new features and update existing functionality all the time. Our To-Do list rarely runs shorter than 20 pages and we add new items to it every day. Obviously we cannot cover all your questions in this quick guide. We have been developing this system for years and it has very wide functionality. But don't worry! Just start by browsing the FAQ and Tutorials sections to dive into the details and to be able to get the most out of EasyHits4U. Also you can get many tips on each page; mouse over on appropriate question icon and you will get a detailed explanation of that element. We have many such tips on site pages! Don't forget that our Support team is happy to help you 24 hours a day as well.